Reading a good book can be a profoundly unique and personal experience. It can also be a rich and layered way to connect with others who may share – or challenge – your opinions. For multiple millennia, storytelling has been a key element that has helped bring people together. Regardless of a person’s race, gender, religious beliefs, sexual identity or cultural background, we can all come together and enjoy a powerful story. This year, thanks to a program called the “Common Reader Experience,” each and every new incoming student – all 2,100 them – had the opportunity to do just that. Erin Wiebe (far right), a senior philosophy and English major, has been a part of the Common Reader Experience program since it first launched as a University Honors Program initiative in 2015. This year she served as a student discussion moderator. Launched in 2015, the Common Reader Experience began as an initiative led by the University Honors Program. 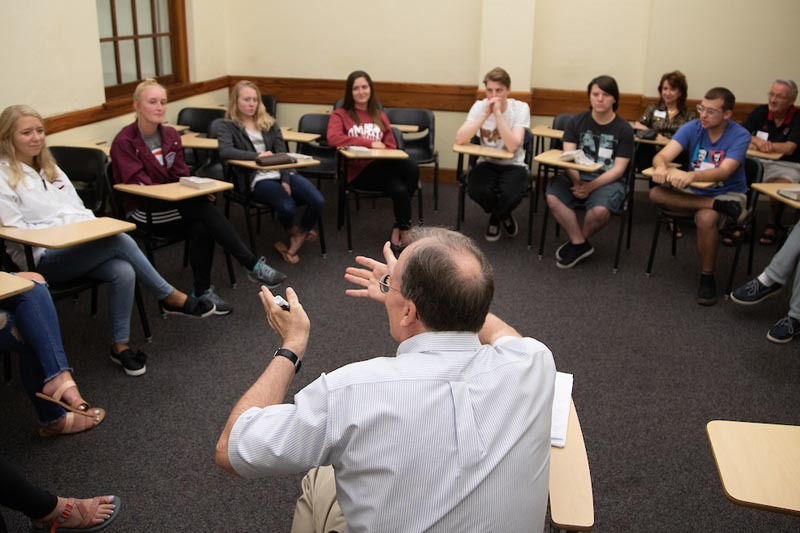 Each summer, new and incoming honors students would be assigned the same book; then, prior to the start of the school year, each student would come to campus in small groups, moderated by faculty, community members and fellow students, to share their experiences. One of the first students to get involved in the project was Erin Wiebe, a senior from Papillion, Neb., who is double majoring in philosophy and English. The experience is one that influenced her so much she has been back every year since to serve as a student discussion leader for each new group of incoming students. Senior Abi Heller, a neuroscience major, listens to a discussion of Willa Cather's "My Antonia." She participated as a freshman and has continued to be engaged in the program ever since. 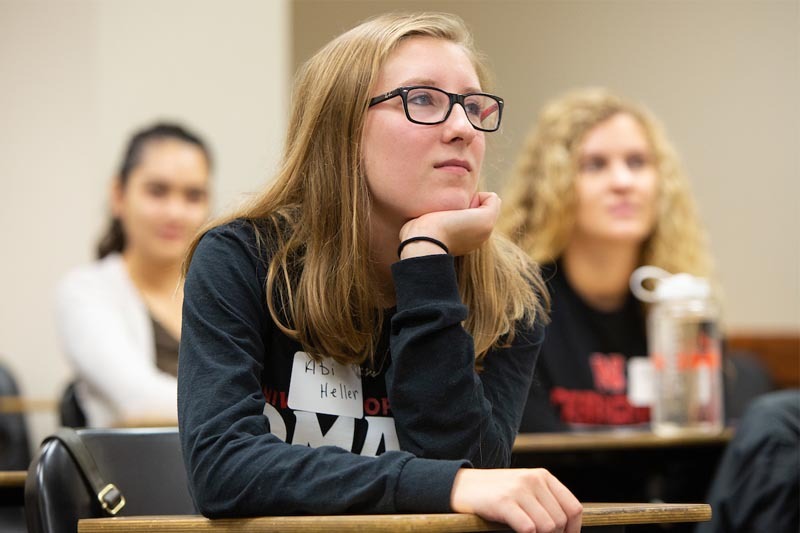 This fall marked the first time the Common Reader Experience expanded beyond the Honors Program to UNO’s entire incoming class. 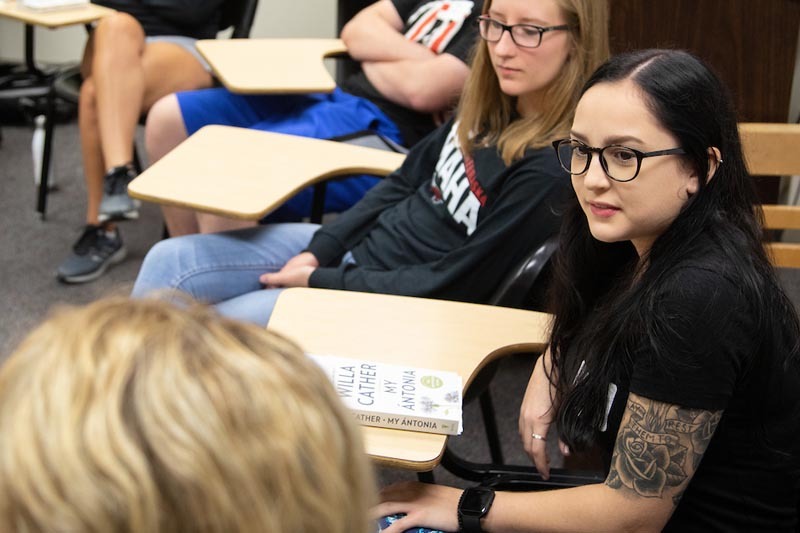 On Sunday, Aug. 20, before the first day of classes, each student, regardless of their major or program, came together to read Willa Cather’s classic “My Antonia,” which tells the story of an orphan from Virginia and the daughter of immigrants who both meet in Nebraska as early pioneers. 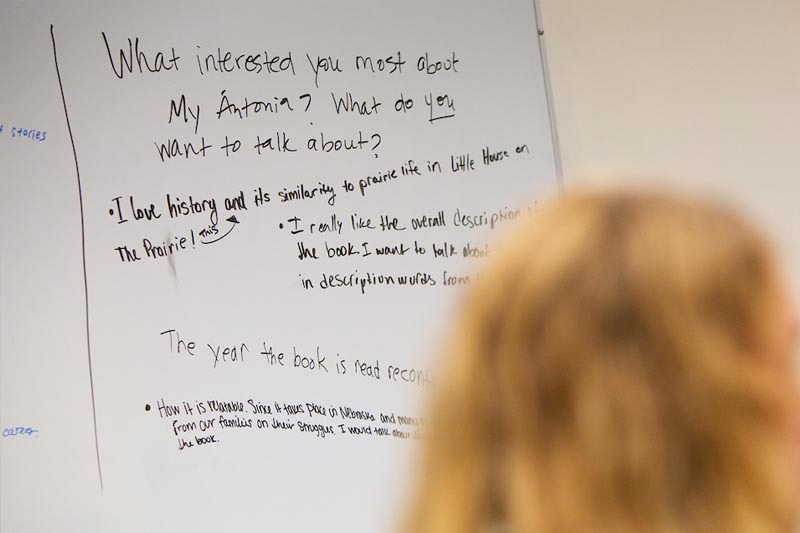 Students were also encouraged to submit their own original artwork, poems, essays and stories tied to the novel, which were then shared with other participants who helped pick their favorites. Senior Abi Heller, of Elkhorn, Neb., has also participated in the Common Reader Experience all four years. Across all four years, the neuroscience major has found that regardless of the topic, engaging in new experiences has continued to be a common theme. The Common Reader Experience allows first-year students to begin their college careers by sharing the same experience as other students, as well as faculty and staff. The opportunity provides ways for students to become engaged with campus early on. Lucy Morrison, director of the UNO University Honors Program and coordinator for the Common Reader Experience, explains that the opportunity to meet with fellow students who have similar questions, apprehensions and fears helps creates a support system that can follow a student throughout their entire collegiate career. The Common Reader Experience follows in the footsteps of other successful learning communities that have been a part of UNO for decades. Statistics show that students who are a part of learning communities are significantly more likely than the student population at large to both stay enrolled and earn their degree. Dalton Meister, a junior social work major, has not only been a University Honors student and participant in the Common Reader Experience for three years, he is also a member of UNO’s Thompson Learning Community, which was created in 2008 to support high achieving students who need financial assistance in order to attend college. Many Thompson scholars are among the first in their families to pursue higher education. “Classroom discussions take a much different shape and form in college than those of a high school classroom, in the approach and the preferred outcomes,” he says. “It's a nice way to bridge the high school and college experiences for students because they get to see what a college classroom looks like if they haven't prior and they will feel more comfortable coming in in the next day - there will be less shock." The Common Reader Experience engages members across the UNO community, including members of the Board of Regents. 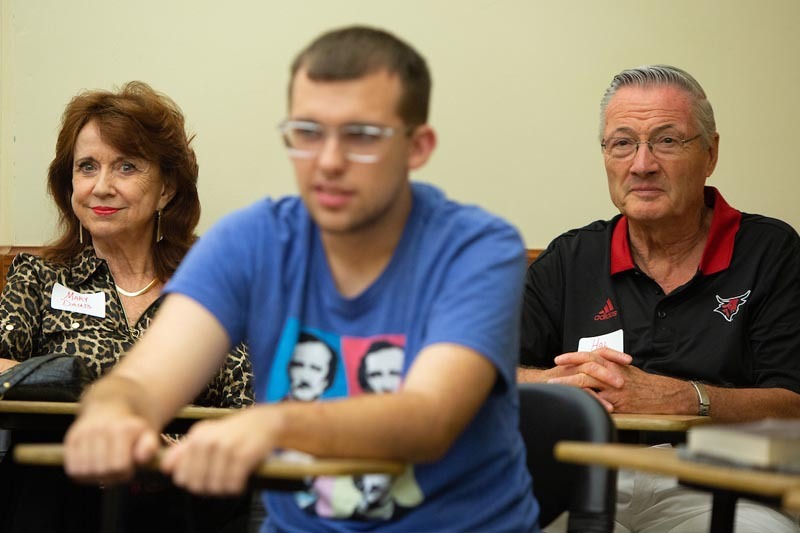 In 2018, Regent Hal Daub and his wife, Mary, helped lead one of the student group discussions. Because the Common Reader Experience occurs so early in a student’s career, it provides a unique first step toward getting involved with campus on a much larger scale. For example, Wiebe plans to participate in UNO’s Research and Creative Activity Fair next spring, Heller is a member of the Nu Rho Psi neuroscience honor society and Meister is involved with UNO Student Government, Sustained Dialogue and a peer mentor in the Thompson Learning Community. Additionally, Common Reader Experience participants are regularly invited to events throughout the school year, many of which connect them with other generations of Common Reader Experience participants, helping to expand the group’s peer network. Wiebe agrees, adding that the program can benefit all students. Campus leaders are already planning for next year’s book choice, but no matter what it is, students like Heller say it will make an impact.